CAD was empowered due to the Oil market reports. The pair is finding support at 1.32440 with resistance at 1.33040 which both lines are below the weekly pivot point at 1.34790. The EMA of 10 is moving with bearish bias and it is located below the EMA of 100 and above the EMA of 200. The RSI is moving in oversold area, the MACD indicator is in negative territory and the Stochastic is moving in low ranges, showing downward momentum. The ADX is showing a strong sell signal. The price has reached the 61.8 level of Fibonacci therefore it may start is upward trend soon. 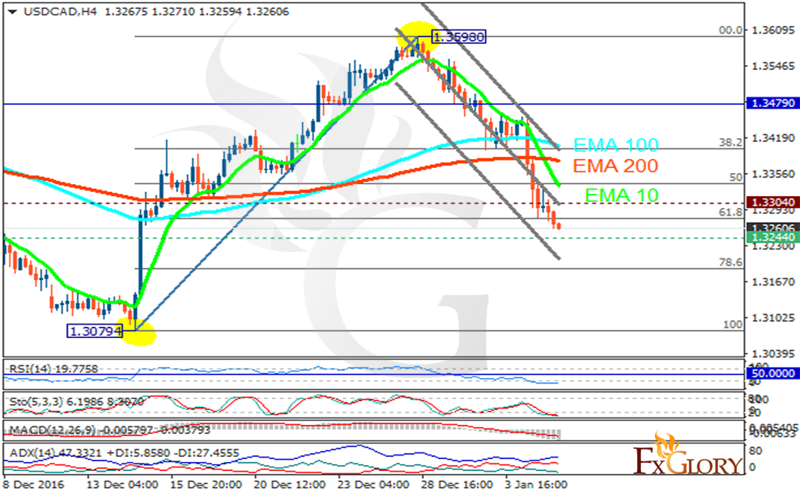 1.3260 can be sellers’ next target however, the price will grow again targeting 1.3330.